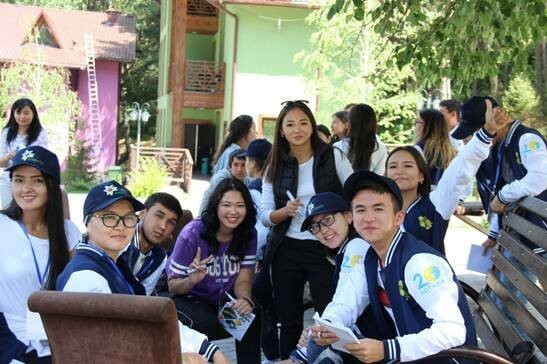 On August 16, 2018,the Social Development Center in partnership with Akimat of Almaty city organized the Youth Summer Camp "Tuģan Jer" at Lesnaya Skazka Resort nearby Almaty. UNESCO Almaty Cluster Office provided training on “Thinking Sustainably: Skills for Integrated Problem-Solving and Collective Actions to Further Sustainability at Local Level” for socially active 75 young people from different regions of Kazakhstan, studying at various education institutions in Almaty. The training was dedicated to the "International Literacy Day 2018", which is being celebrated under the theme of “Literacy and Skills Development” this year. During the introduction part of the training, participants got acquainted with Sustainable Development Agenda 2030, SDGs, including SDG 4 on quality education for all through presentation and interactive videos. Participants were asked to present their own perspective view of sustainable Kazakhstan by 2050 based on presented information about SDGs. The main ideas proposed included preservation of natural resources and using renewable energy sources as well as ensuring people in need with quality and inclusive education and eradicating corruption and unsustainable production and consumption in the country. For the main part of the training, participants had the opportunity to learn about the theory of the problem-solving cycle, based on Pearson’s publication, including criteria for selecting ideas to solve the problem. In addition, participants also learned about what skills are necessary for collective actions at local level such as teamwork tips, volunteering, implementing community service projects, active civic participation and support to local community. As a concluding part, participants were asked to discuss in their groups and present concrete steps for implementing their service project that are oriented to further sustainability at local level. The steps were based on pre-distributed problems from topics on UNESCO’s "Education for Sustainable Development Goals Learning Objectives" publication. By the vote of participants, the winning team was the one, which presented the project on volunteering with the local orphanage to renovate and repair its playground and territory, with fundraising from different sources as well as through permission and discussion with Akimat on implementing this project. One of the participants Alexei Karimov, student of Turan college, shared his thoughts about the training:“Training was indeed very informative and comprehensive. Some of the ideas presented were already in my mind, but I didn’t know how to realize them. Thanks to this session, I have more concrete steps now, as the training provided very structured information on problem-solving cycle. I also liked that the training was in a very interactive format, which fully engaged me to the training activities and exercises. Moreover, I am glad that my counterparts were also not indifferent to the issues of the sustainability in our country and the world as a whole. And who knows, some of us or we altogether could bring positive changes to solve some of the burning issues in the society”. As a result, participants learned about the UN Sustainable Agenda 2030 as well as key problem solving steps, which are necessary skills for everyday use at both personal and community level. They have also acquired knowledge and skills on how to work together for the sustainable development of their community, where they live, study and work.